This continuous arm settee I made back in 1992. 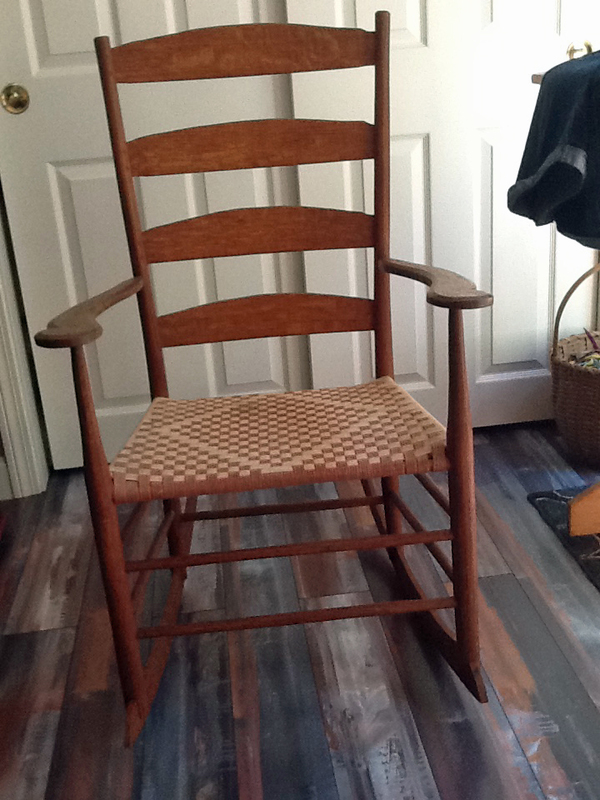 A friend bought it not too many years ago, along with a windsor rocking chair, in a house-moving/divorce sale (I think). I wish I had known, I’d love to have this settee – I doubt I could make it again…but I know it’s appreciated where it now resides. This next one I did buy, and sold again. I had it in my shop for years, a fellow called me up one day asking if he could buy it & he did. 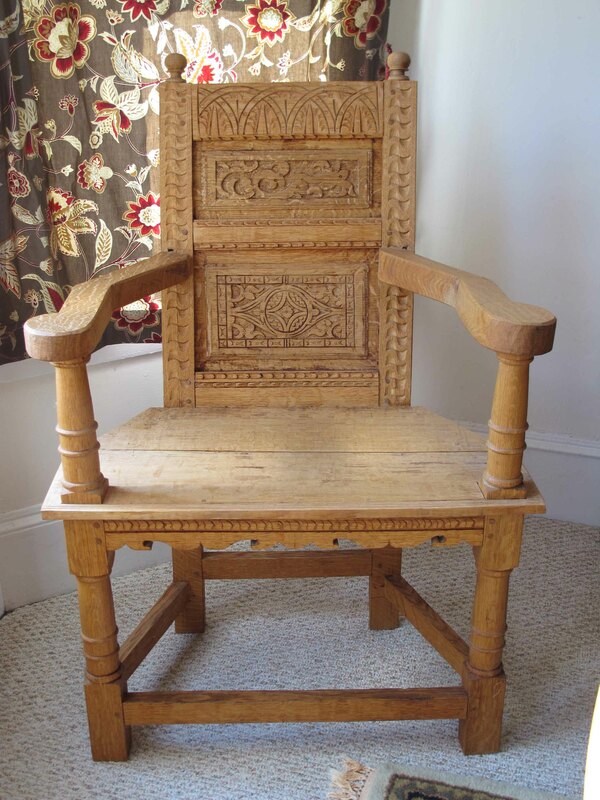 Then a couple years later, another friend called me to say one of my carved chairs was in an auction in Maine. 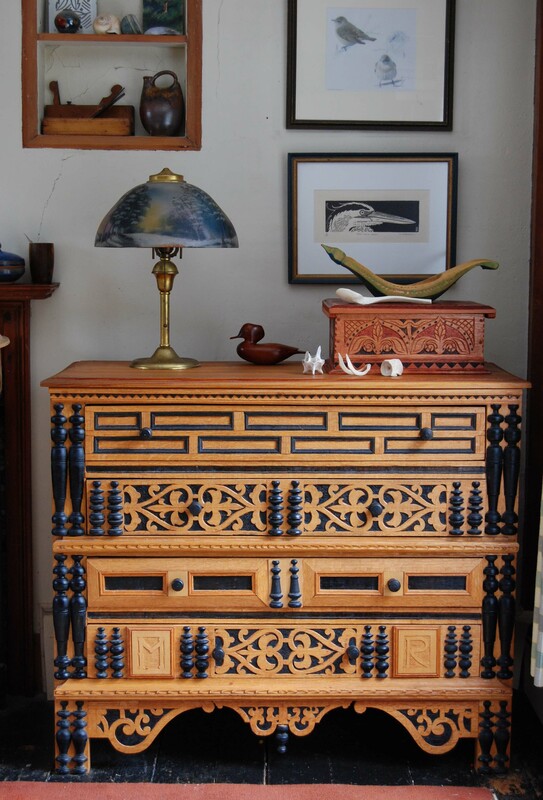 I eventually got it through the auction, and called a couple who has collected several of my carved pieces. I offered them this chair at a reduced price, and they said they’d love to, but were out of room. An hour later, they called back & said they made space. Another wainscot had a slightly sad story to it. I made it at the museum as an award (I was the awards department for quite a while) – for our former co-worker Karin Goldstein. Sadly, Karin died quite young, from cancer. Just shy of 50 maybe. When she died, she had no local family, and some of her stuff ended up in a local shop. Another friend saw this, called to confirm it was my work, and ended up buying it for his wife, a good friend of ours, and of Karin’s. So a semi-happy ending. 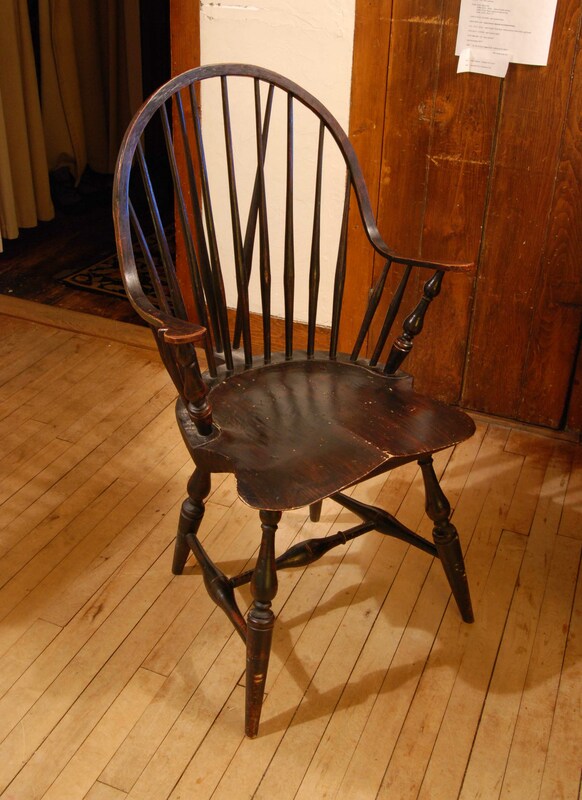 This week I got a note from another friend who found a chair “made by the guy at Plimoth Plantation” – well, sort of. 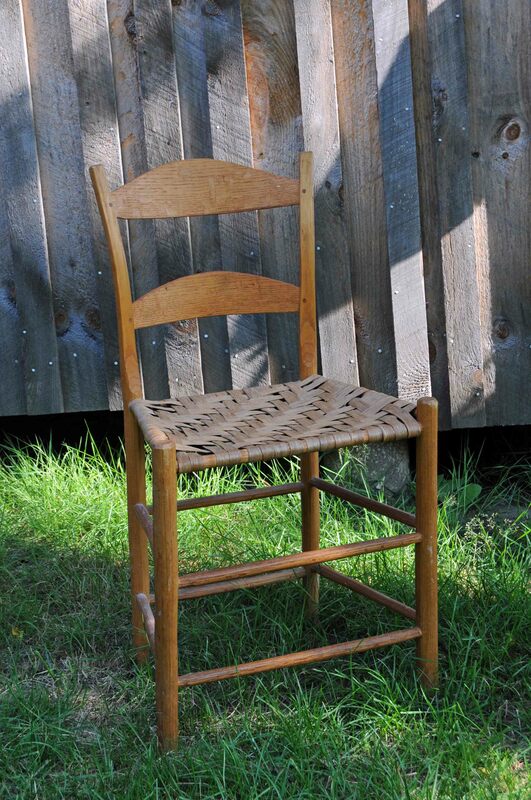 I was there for 20 years, but I made this chair well before that – I’d say late 1980s, maybe into 1990/91. She got it for $45. Even I could afford that! The last one in this batch has the best story. Found at the swap shop in the Hingham, Massachusetts town dump! $5.00. A friend got it after some tussling with other dump-shoppers, and gave it to us. 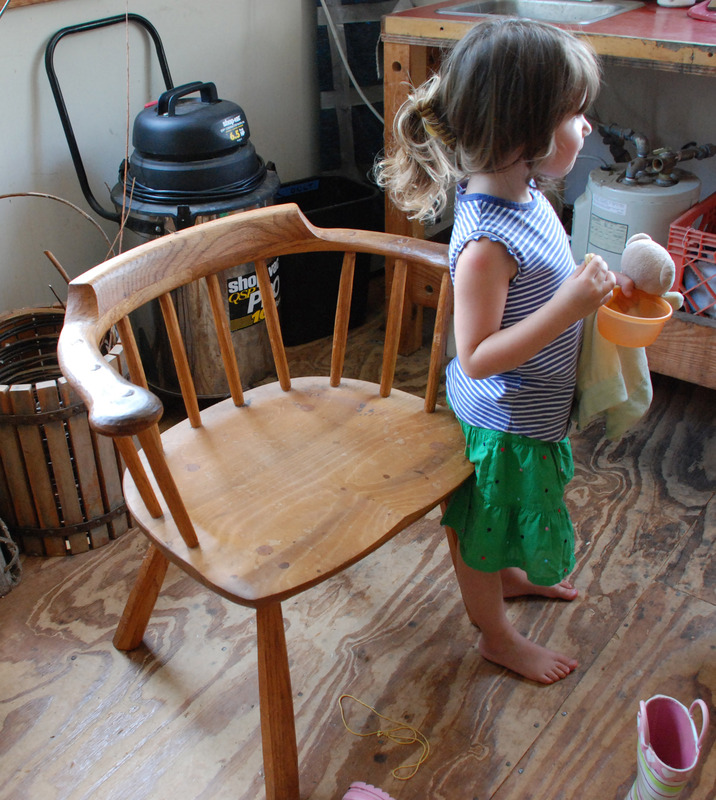 This week, I have been making this little, big rush-seated chair. Little because it’s a low seat, generally small-size chair. Big because it’s not subtle – the posts are almost 2” square, the rungs fit in holes that are 15/16” in diameter. So little big chair. 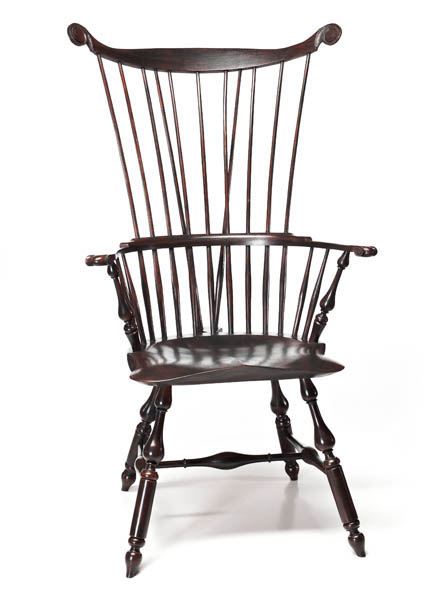 It’s based on 17th-century chairs that we mostly know from Dutch artwork, more-so than from surviving examples. 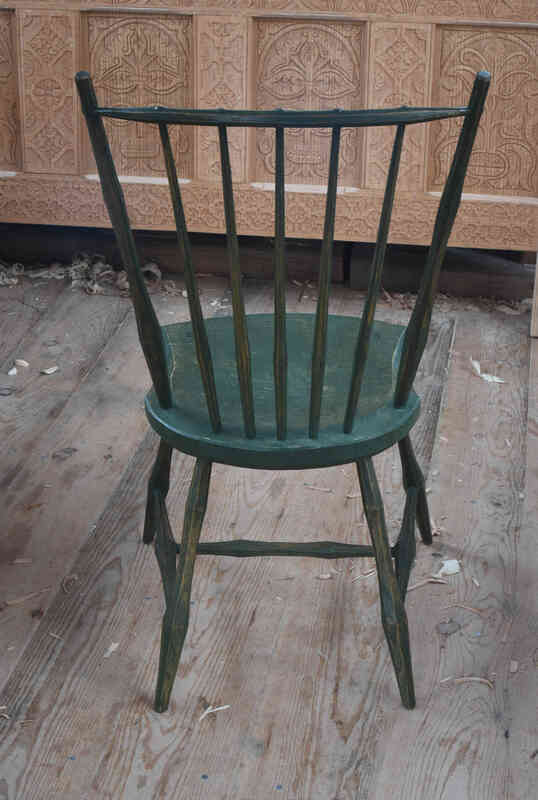 (next up for it is trimming the posts here & there, weaving the seat…) These are ancestors of the ladderback chairs that I first learned back in the late 1970s/80s. Here’s one that I did about 1984 or so. A more recent kid’s version too. 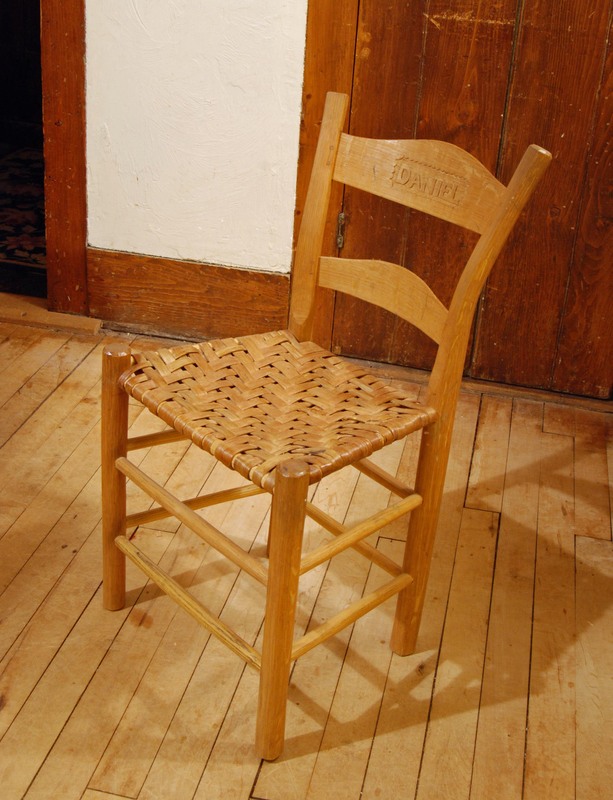 I began as a chairmaker. 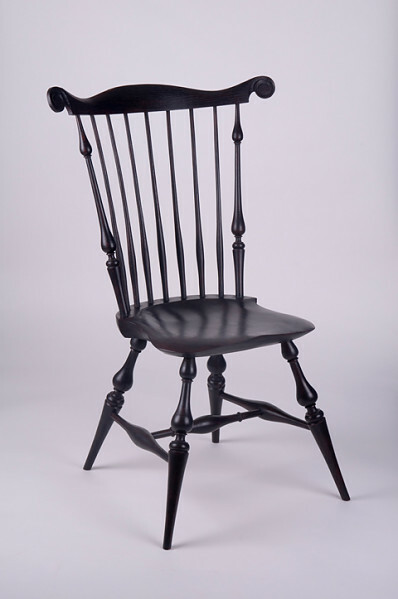 Made ladderbacks, rockers, Windsors – then got into the 17th century & made wainscot chairs, 3-legged & 4-legged. Turned chairs ditto. Leather chairs. Chairs w boxes in the seat. Kid’s chairs, high chairs. My semi-latest chair was the walnut brettstuhl. 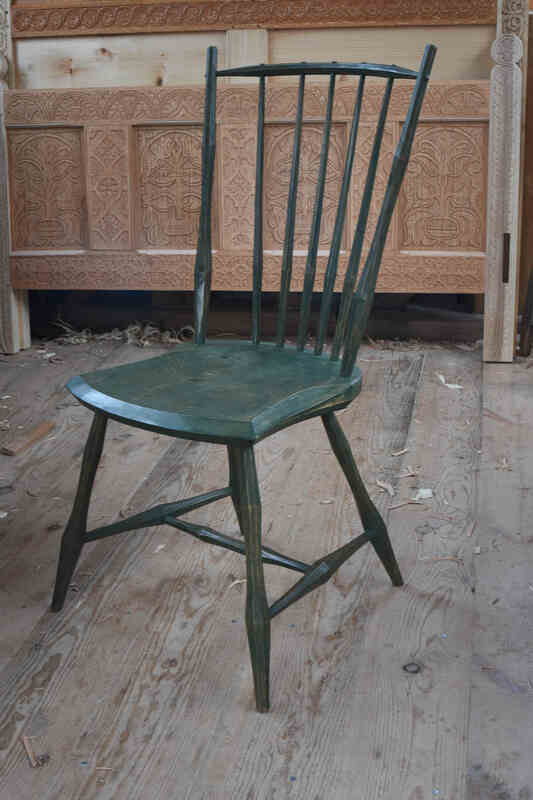 But at our kitchen table, the chairs we use at every meal and then some are Windsor chairs I made 20-25 years ago. At my desk too. 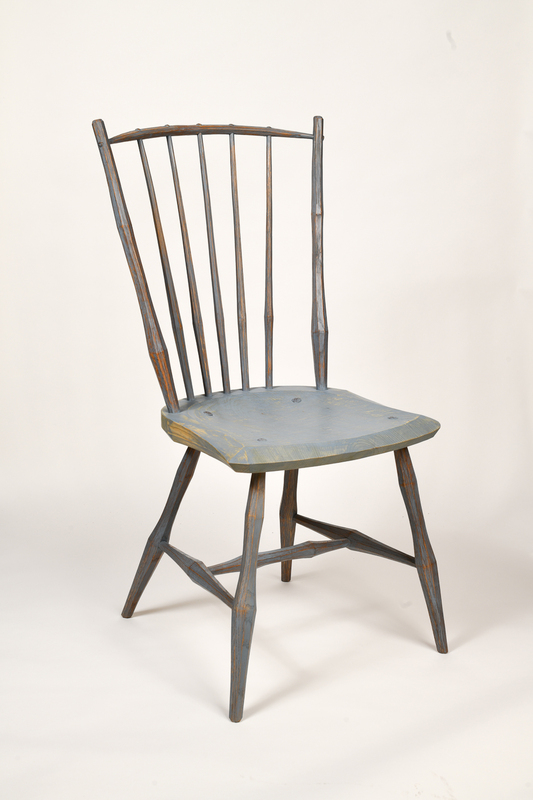 I once had one of those stupid office chairs, then I came to my senses & remembered that I am a chairmaker. Windsors are lightweight, comfortable, attractive. Sturdy. 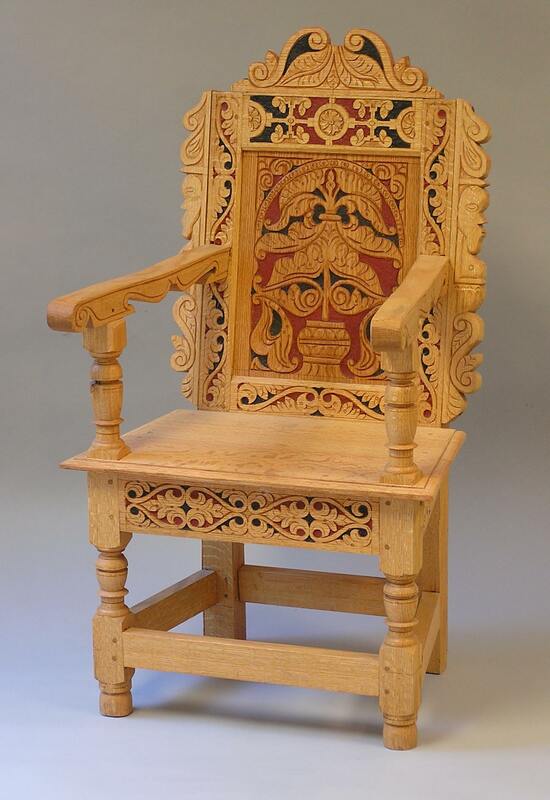 Fun and challenging to build; carving, turning, shaved work, sculpted seats. good all around projects. And so much variety. 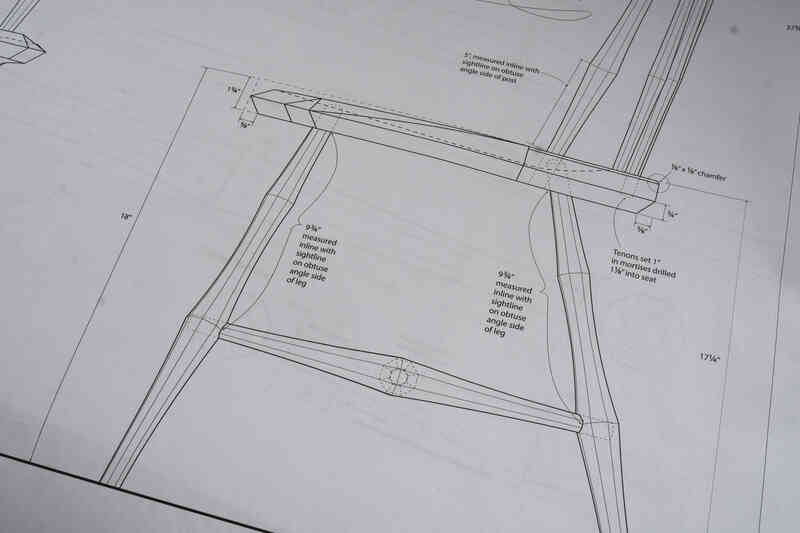 One of the days that the mail got through here, I received Curtis Buchanan’s next installment in his printed plans for his chairs, this one a fanback side chair, one of my favorites. My woodworking career began with logs. 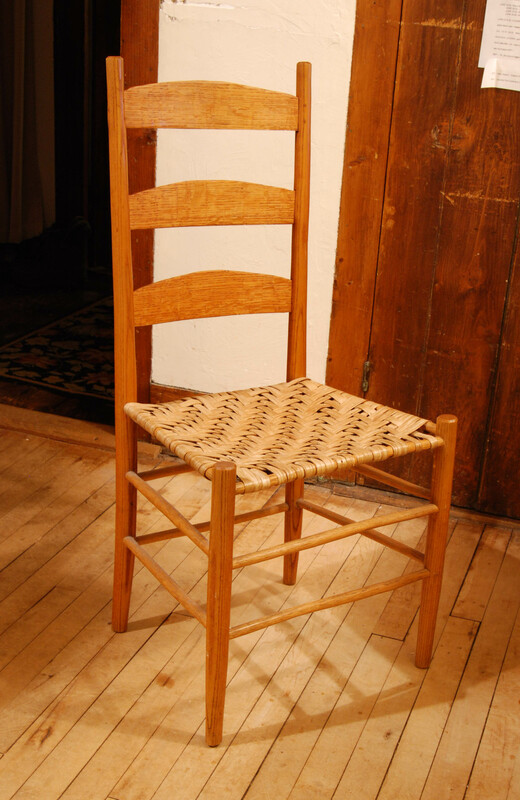 I first made lots of ladderback chairs for several years, then in 1987 I spent a week as a student in Curtis Buchanan’s first Windsor chair class at Country Workshops, run by Drew Langsner in Marshall, N.C. The following summer, I was an intern at Drew’s place, so got to sit in on Curtis’ next class. That time, I didn’t make the chair again, but tried to soak up the content that was over my head the year before. 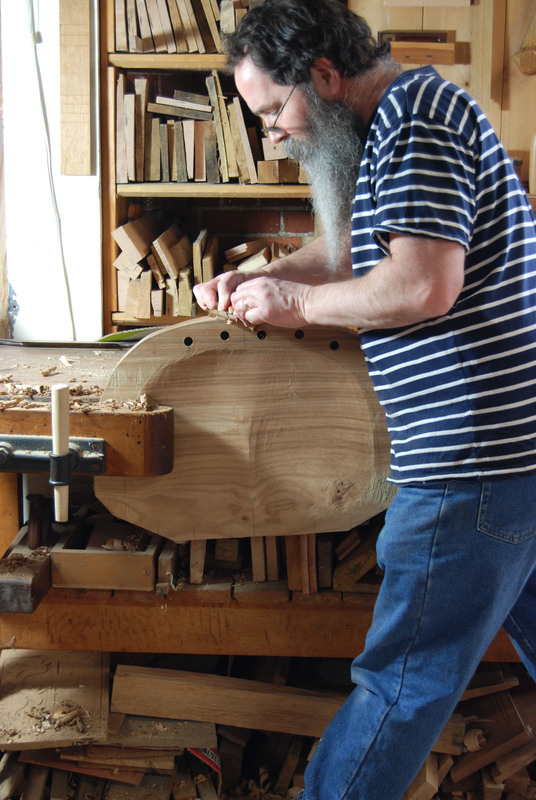 After that, I would regularly write or call Curtis for more plans, details and chairmaking tips. 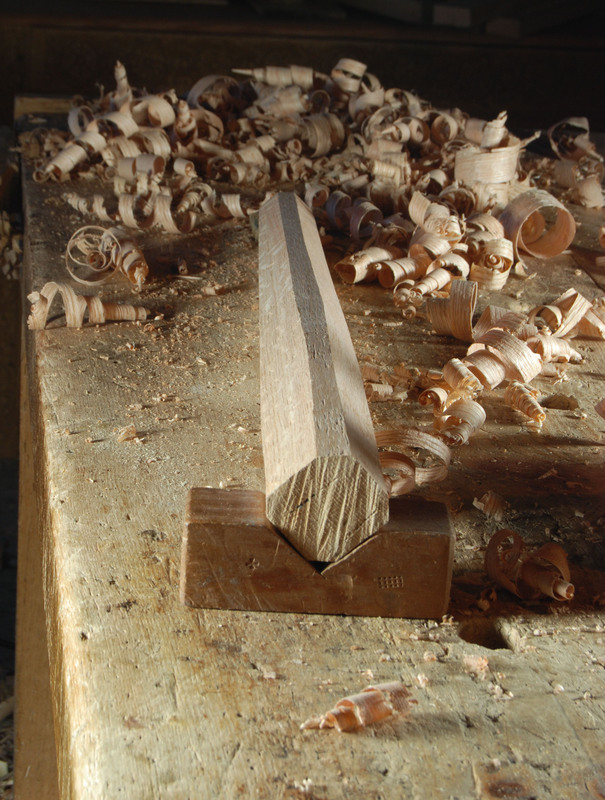 I eventually made somewhere around 50 Windsors before detouring into joinery and oak furniture. Every blog post I write here is composed while sitting in my copy of Curtis’ comback arm chair that I made about 1990. Maybe you’ve seen Curtis’ videos on Youtube, but now you can get the full set directly from him in a binder. It’s broken down into 10 discs, amounting to around 11 hours of video. 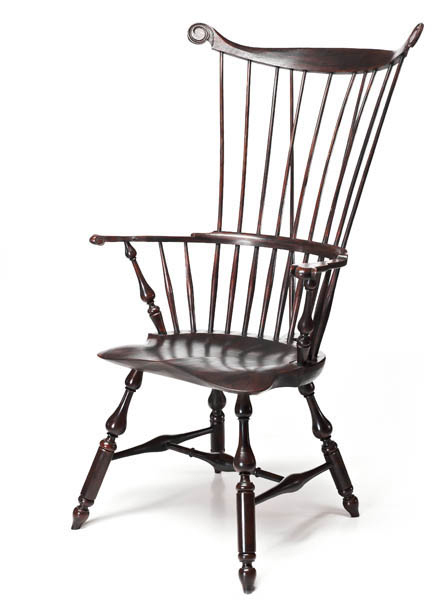 There is an additional disc that has more than 30 photographic views of the completed chair from almost every conceivable angle. These are home-made videos. If you have ever met Curtis, then you know what to expect. It’s just as if you were watching him explain the process as he makes the chair. I’ve done several how-to videos, and no matter how much practice I have at explaining my craft, to stare into the camera’s lens and talk to it is weird. Curtis tried a professional video production once, but quickly realized that it’s not his style. But don’t confuse informality with un-professional. 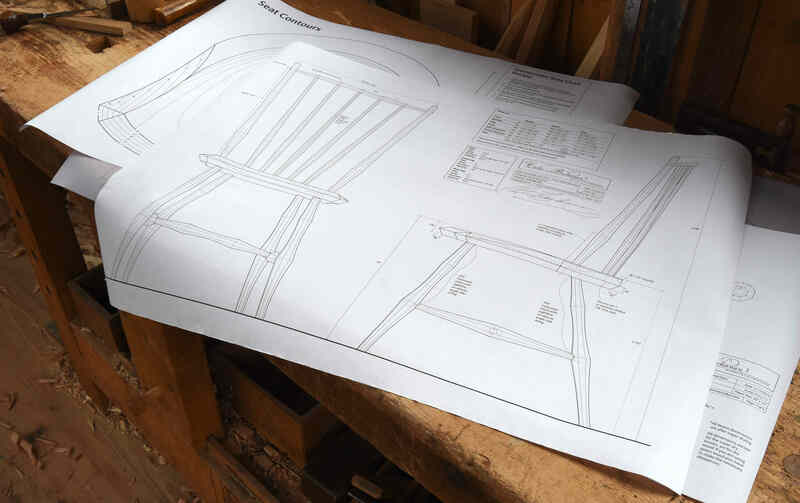 Curtis really teaches you how he makes this chair, step by step…if I had any room at home, I’d take a shot at making another. 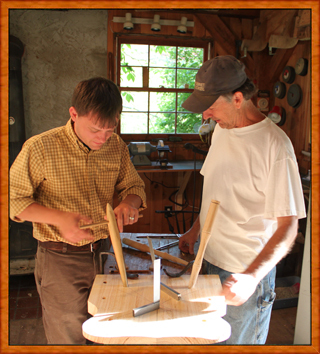 One of the best thrills I had in recent years was when I taught a box-making class at Drew’s and Curtis came to be a student. After 20 years, I finally had something I could give him. Later, I was working the seat again. Here I am spokeshaving the edges after having trimmed them earlier to define the outline. Mine’s an old Stanley 151 spokeshave. 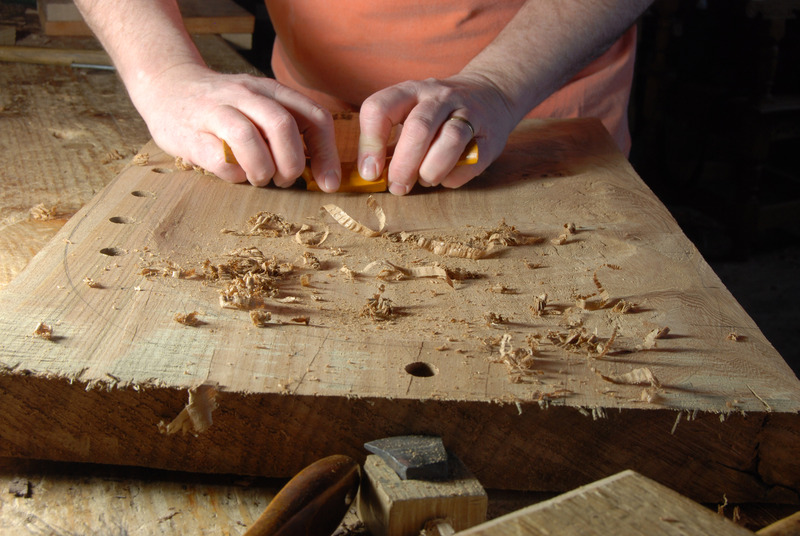 By the time the real souped-up spokeshaves were available, I was no longer really a chairmaker, and as a joiner I rarely use a spokeshave. This one works OK; if I did a lot of work with a spokeshave, I’d look at the new versions. This project is something I am trying to fit in around my regular work, but so far I have managed to get the bulk of it to move along. Now I gotta go searching around for some stock for the arms. I have plenty of ash & hickory leftovers from turned chairs for the spindles. 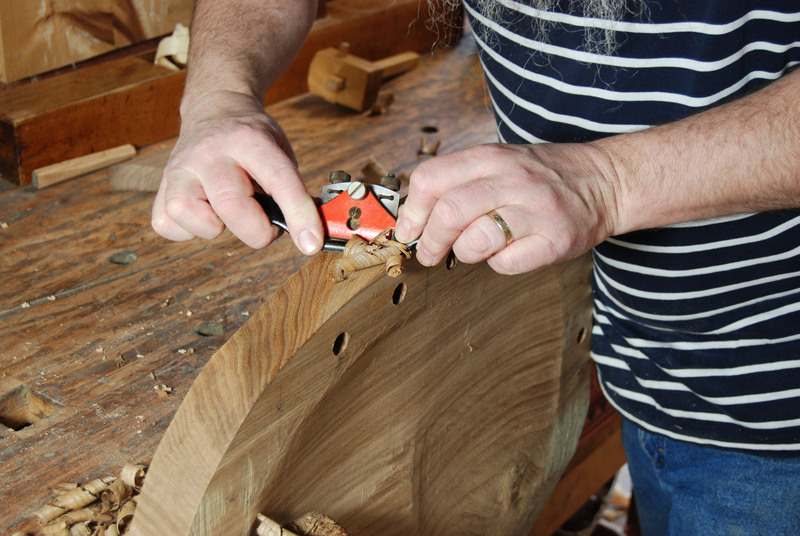 Here’s the elm seat from the other day. I got to work on it a little while yesterday. 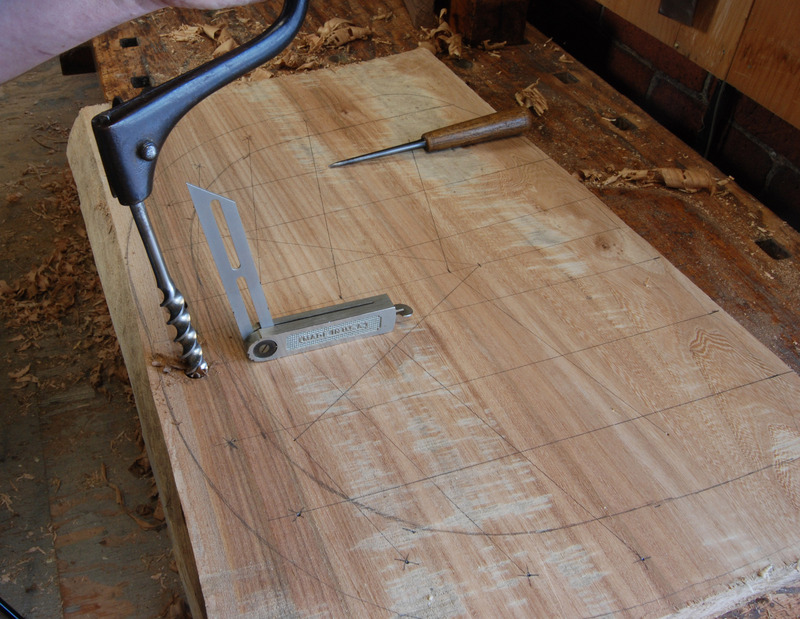 It’s a nearly-quartersawn section; just near the front edge of the seat the board gets close to the heart of the tree. It was shaving very nicely at this point, & I’m close to getting the hollow in the seat done. Right now I don’t have a functioning bow/frame saw, and am not going shopping anytime soon. 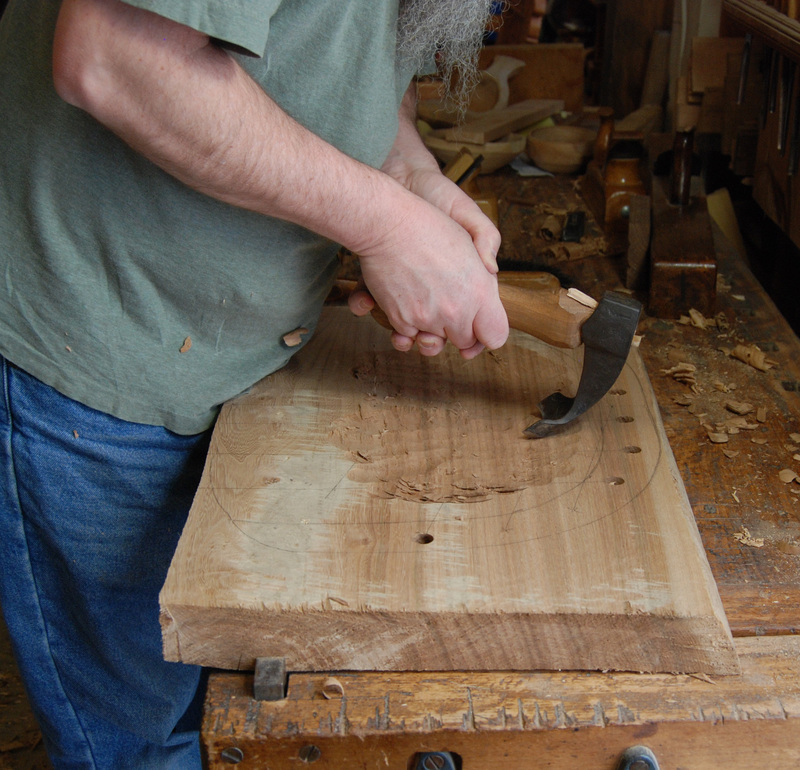 So I took the simple way out to cut the pattern of the seat – I just made a series of straight cuts that I will follow with drawknife & spokeshave work. 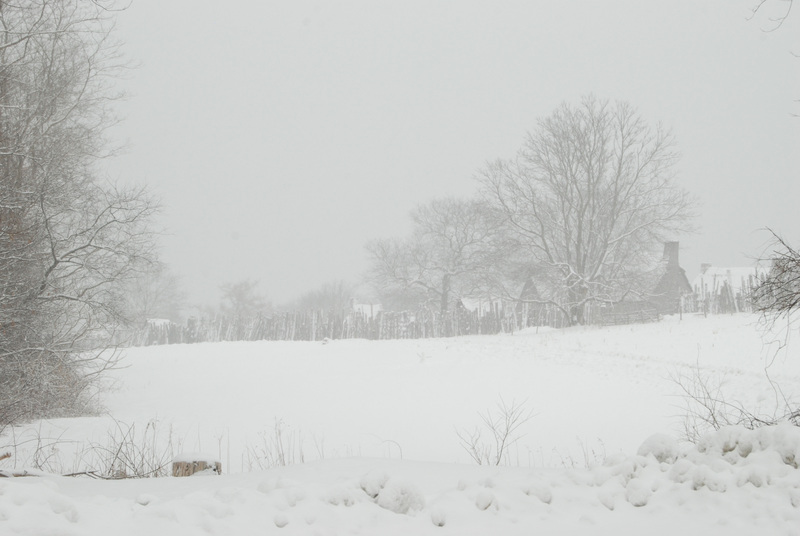 Here’s the scene (cropped) out the window of the shop. 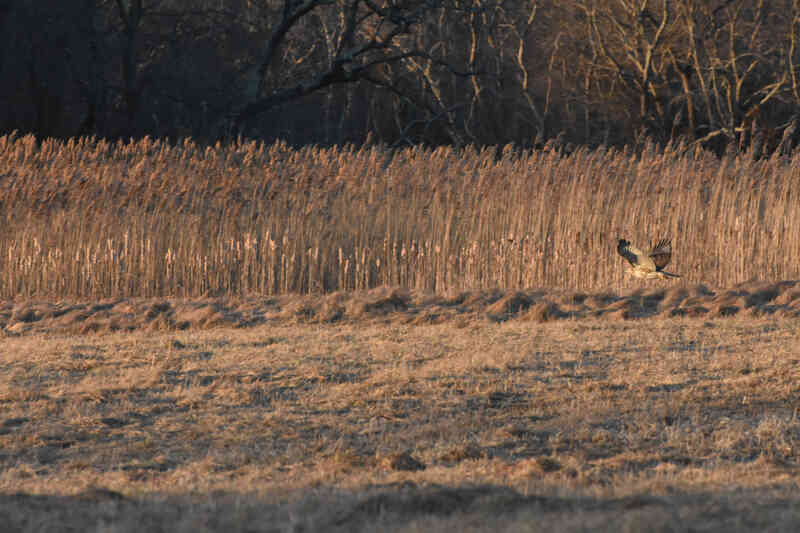 Didn’t bother with binoculars and eagles, visibilty was pretty bad, but the scenery was great, if that makes sense. I was out of the shop for the past week or so. When I have a bit of a hiatus like that I like to start back up with some physical work to loosen up again. Yesterday I chose a long-waiting extra-curricular project to warm up with. 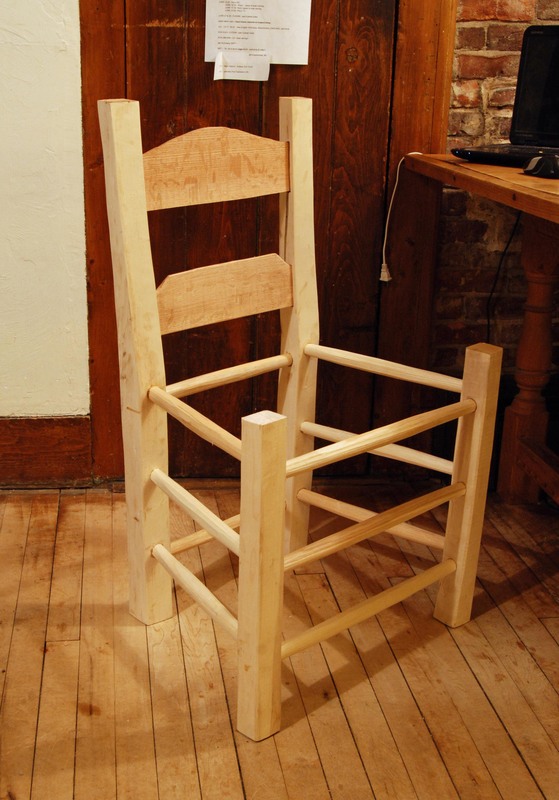 A few years back, I saw this chair made by Drew Langsner when I was teaching at Country Workshops. 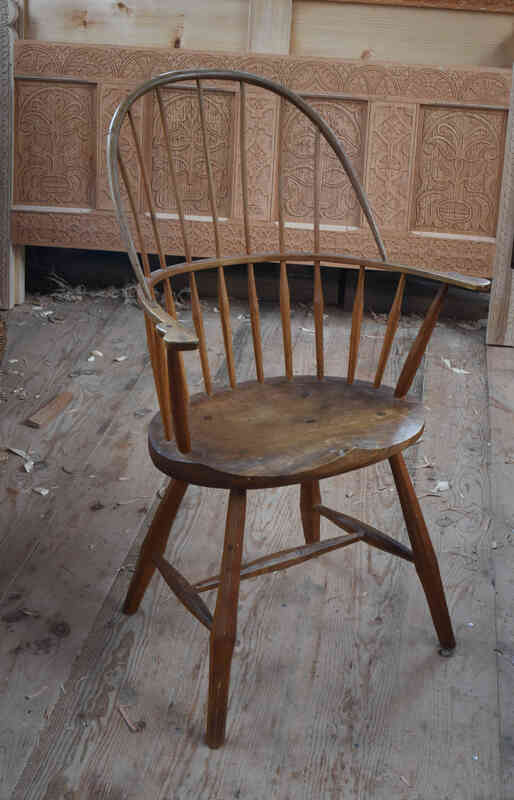 It’s the first Windsor chair I have really wanted to make in many years, after having first seen them in John Brown’s book, Welsh Stick Chairs, then I saw some old ones on my first visit to England in 2000. 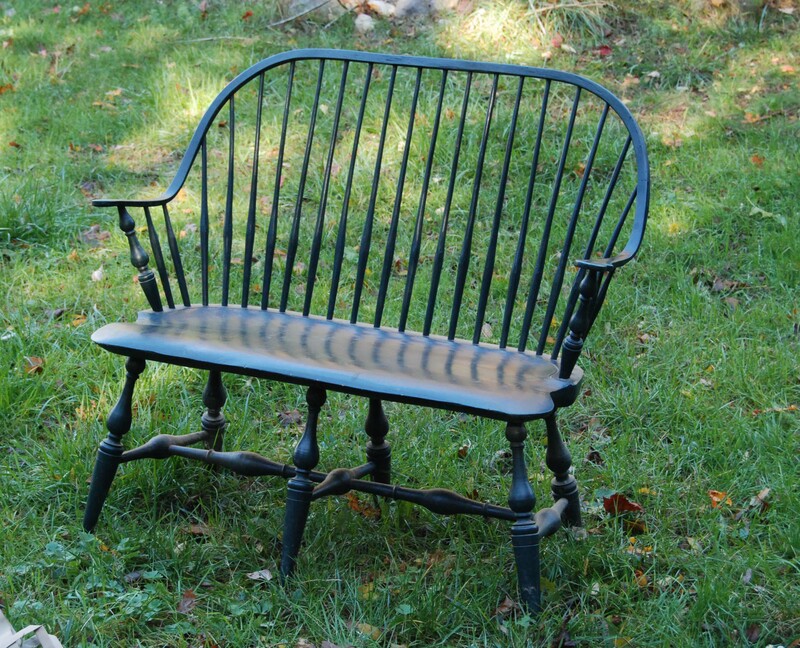 Back in the 1980s I made lots of American style windsors; but left that work behind for joinery. But I knew when I sat in Drew’s chair that I wanted to make one or two for the house. 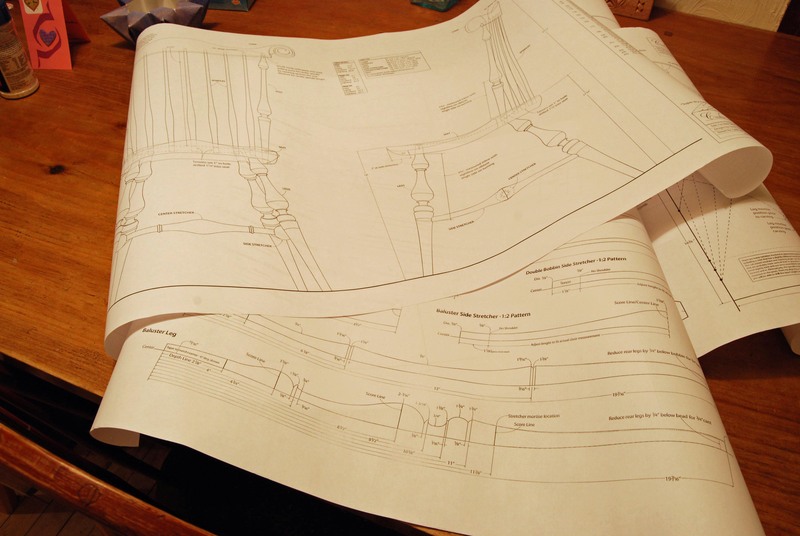 There’s plans for it in his book The Chairmaker’s Workshop, so I generally based the one I started on the seat plan in the book. I had an elm plank that was nearly perfect for the seat. I made a cardboard template for the seat’s shape, and marked the positions for spindles and legs. This ain’t joinery, so those that know me might be surprised to see pencil lines – but they really help in boring these compound angles. I bored most of the spindle holes, but a couple I wasn’t sure of the angles (from Drew’s book it looks like the angles are for the high-back version of this chair). So I left a few to be bored once I have the arm bow made & test-fitted. 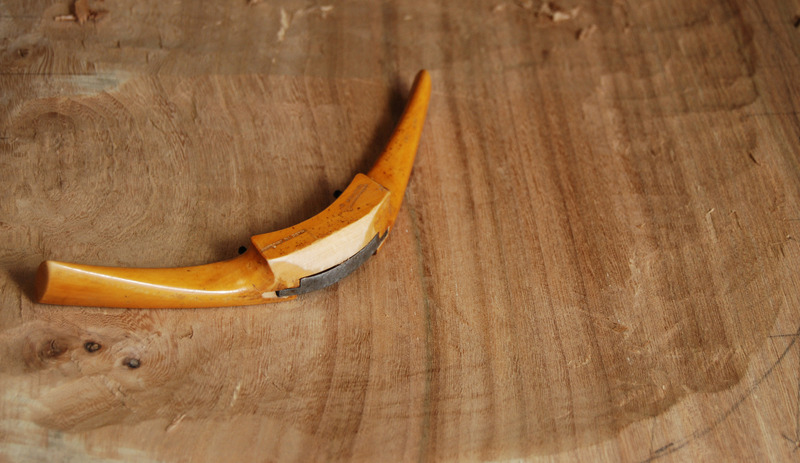 Next up was adze work. I clamped the seat in between bench dogs on my #2 bench, the German one with vices. 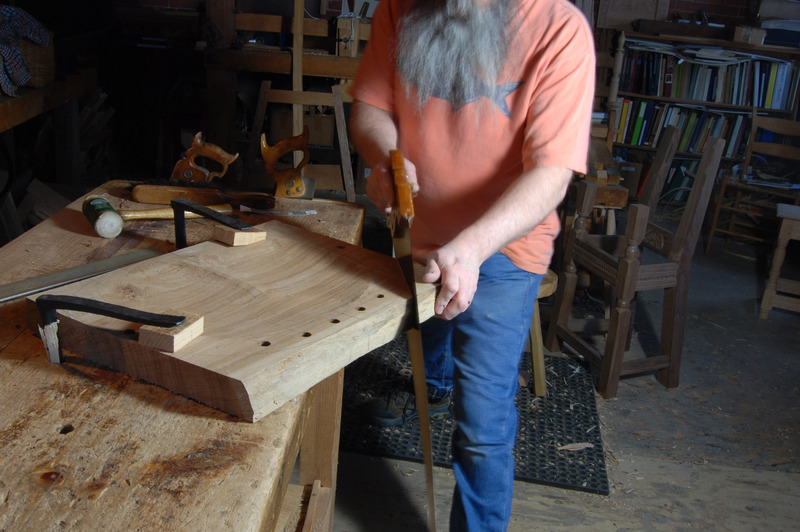 Standing on a plank to raise myself higher, I worked mostly across the grain of the seat with my small curved adze. 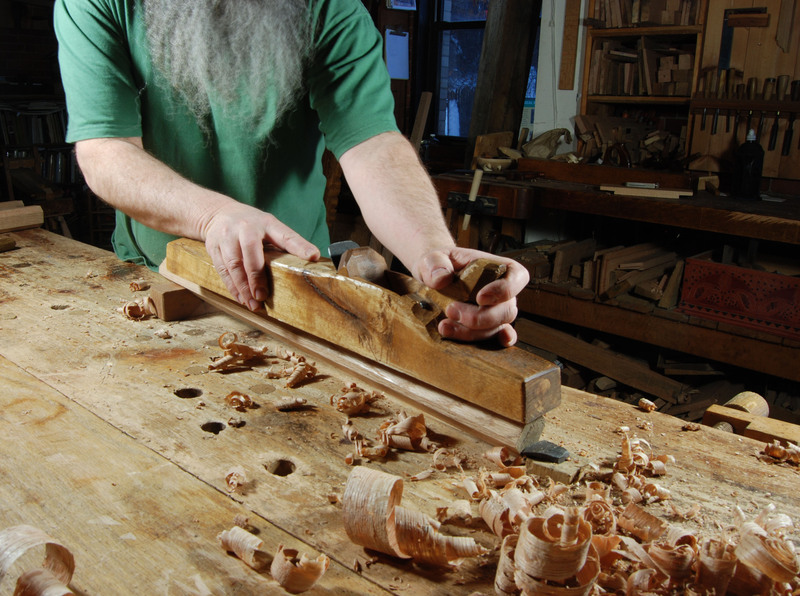 This tools works well, I used it a lot this summer making hewn bowls. Jogge Sundqvist taught me to swing or pivot it from the wrist, while ‘throwing” it too. 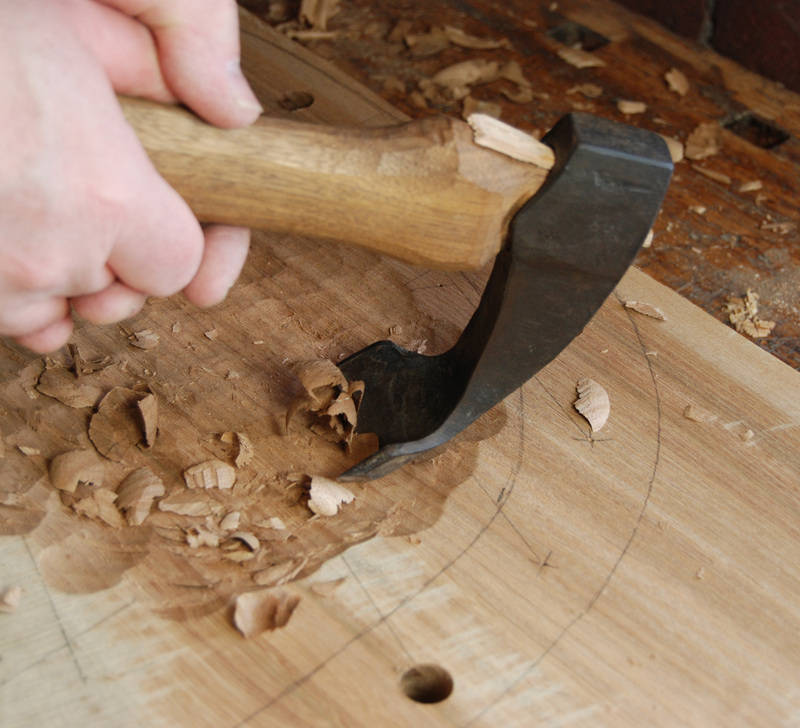 I followed this tool with a curved drawknife, called an inshave. I have one I bought many years ago, it’s OK but not a great tool. It’s just that by the time good inshaves were available, I was getting out of Windsor chairmaking. 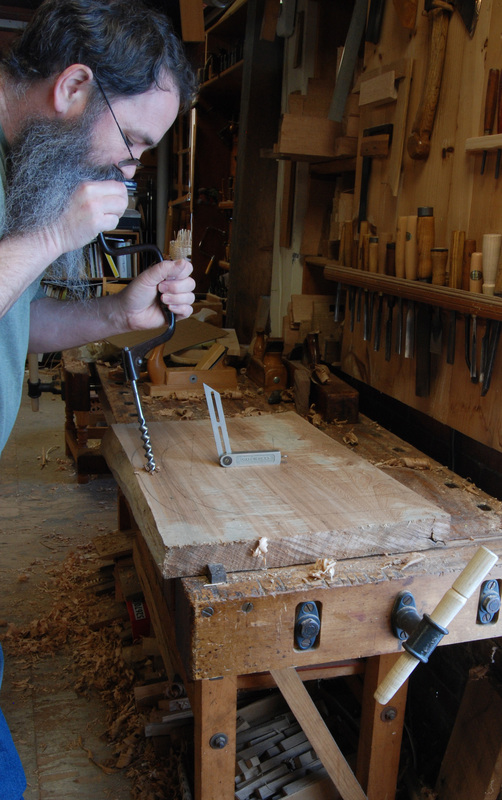 I have a small hollowing spokeshave I use to clean up the inshave work. And that’s as far as I got, about 2 hrs all together, to make the template, mark the seat board, bore some of the holes and begin shaping the seat. It’ll take some more hollowing to finish the seat off, then comes cutting the shape. 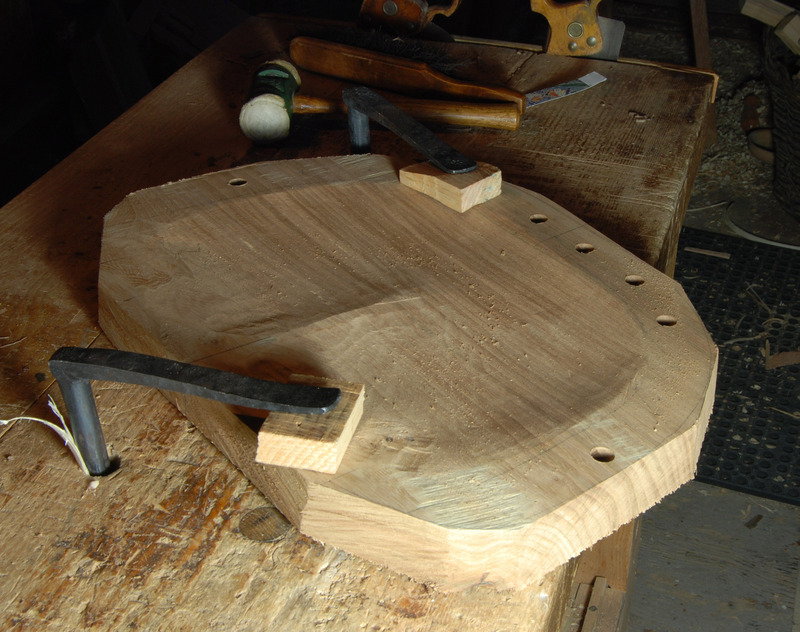 So it took 2 or 3 years to get started, but now my new Windsor chair is finally underway. Hopefully I’ll get some time to keep it moving along. See http://countryworkshops.org/books.htmlfor Drew’s book, & I think they have John Brown’s back in print too.